The weekly In Defense of Truth broadcast is approximately 30 minutes in length. The following broadcast files are in excess of 5MB each. All of the broadcasts mentioned above are available to you through podcasting! Copy the entire web address shown below into your favorite podcast software. In Defense of Truth has been submitted to the iTunes Store but is still unable to be found. 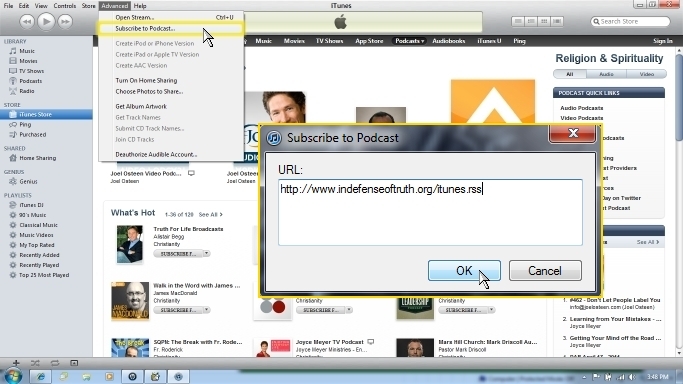 Follow the instructions below to manually load the In Defense of Truth iTunes podcast into your iTunes software. Click on "Subscribe to Podcast..."